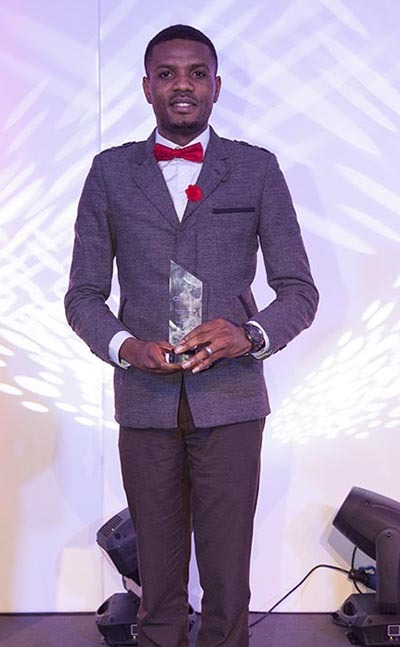 PhD student Justin Okoli has won the 2016 Student of the Year Award at the Alarm Risk Awards dinner, held at The Palace Hotel in Manchester last week. Alarm, a public risk management association, awards one exceptional student each year for academic achievement and professional development. "Winning ALARM student of the Year Awards is one of the most outstanding achievements of my PhD journey," says Justin. "I am happy that my hard work and dedication all through my Doctorate program eventually paid off. "To have a corporate body that recognizes and celebrates such hard work is even more inspiring." The student must also have recently completed a qualification in risk management – showing an understanding of risk and how to apply this knowledge into practice. Justin recently completed his PhD entitled: Expert knowledge elicitation in the firefighting domain and the implications for training novices. Facilitating the development of training curricula, his research is the first to examine cultural differences between the UK and Nigerian fire services. His findings have already been published widely - featuring in four conference papers and four peer reviewed journal articles. Highly regarded as a measure of excellence in the management of risk and insurance, the award offers Justin the opportunity for recognition and a chance to share his achievements with the wider community. "Special thanks also to my supervisors who consistently demonstrated unflinching confidence in me, ensuring that my learning experience was rigorous and encompassing," adds Justin. With an MSc in Disaster Management and a PGCert in Risk Management, alongside his work as a voluntary safety advisor with West Midlands Fire Service, there is no doubt that Justin’s future looks alarmingly bright.